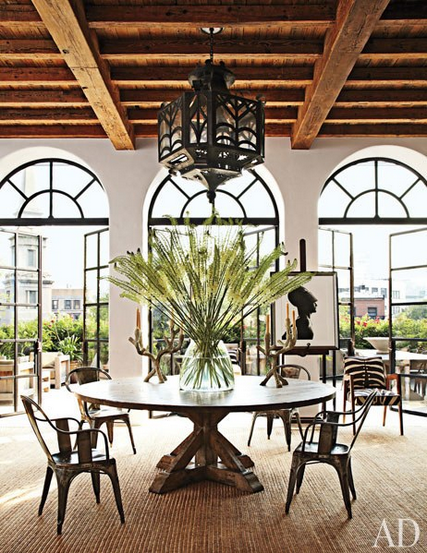 Alfredo Paredes Manhattan home with stunning arched steel casement doors which make this space so spectacular. I get so smitten every time I see a room with steel casement windows or doors, gladly they are getting more and more popular as we can see their beautiful presence in almost every design magazine issue lately. I like to see them in all their different uses from windows to doors to kitchen cabinets to shower enclosure although, I have to say that they reign more when used as French patio doors. After all, there are wood French patio doors and there are steel casement French patio doors with the last one being within its simplicity, extremely elegant and restrained. Steel doors and windows look their best when used against clean concrete walls in more industrial or country settings but they can also look pretty seamless when used against stone walls. Steel windows and doors are somewhat a kind of a design import from France where it has been used abundantly from Paris to the country side.